Setup Area: 33ft. x 8ft. x 9ft. The hot days of summer is a cool time to have some water fun! What better way to cool off, slipping n sliding through the single lane Coconut Cove Slip N Slide. 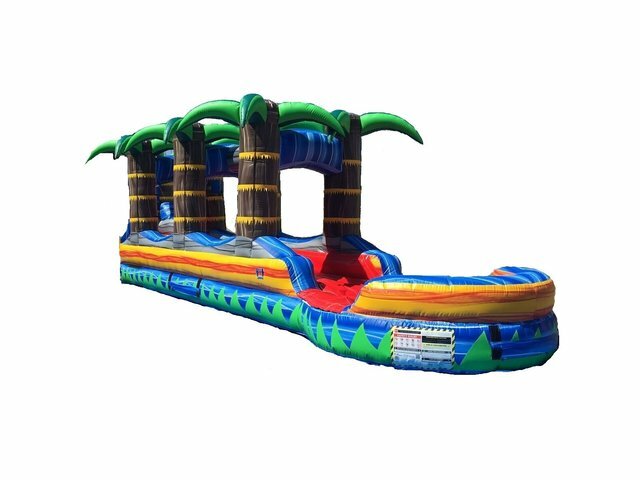 This slip n slide rental features bright vivid colors, a misting system, along with palm trees and a pool. Each guest takes a turn, running, and then sliding their way down 33 feet of cool refreshing mist and splashing in a pool of cool water. Not only do children enjoy this unique inflatable slip n slide rental, but adults do also! The compact design is perfect for any backyard, park, or anywhere else you would like to have your event. A must have rental for birthday parties, family gatherings or church events.